Delivered: 1 March 1926, Moscow. First Published: Volume 21 of the Collected Works of L.D. Trotsky (Moscow State Publishing House. 1927). Source: Radio, Science, Technique and Society, published by New Park Publications Ltd. 186a Clapham High Street, London, SW4 7L; September 1974; Permission granted by Index Books, London. Reprinted from Labour Review, Vol.2 No.6#lr57_11, November-December 1957. Translated: Translated by Leonard Hussey (Brian Pearce). ON the fortieth anniversary of the October Revolution we are publishing, for the first time in English, a speech delivered by Trotsky on March 1, 1926. It is his inaugural address at the First All-Union Congress of the Society of Friends of Radio. There are those who credit the advances of Soviet science to Stalin and his successors, who have allegedly diverted funds to science which would have been better spent on improving the Russian people”s living standards. Others say that Russia’s scientific achievements merely show that the men in the Kremlin understand the importance of science for war preparations. Others again say that Russian science remains backward as a whole, but that it has developed a number of specialists in spectacular fields. We believe that all these views are profoundly mistaken, and that the present victories of Russian science flow directly from the victory of the working class in November 1917. Nationalized industry released men from the fetters of private property. The Revolution released scientists from the fetters, material and ideological, of class society, and laid the foundations for men’s conquest of nature. The Stalinist bureaucracy have hindered and distorted the development of Soviet science. The anger with which it greeted Dudintsev’s novel Not by Bread Alone, whose theme is the barriers to genuine scientific research erected by self-seeking bureaucrats, shows that scientific advance has been made in modern Russia in spite of, not because of, the rule of the bureaucracy. 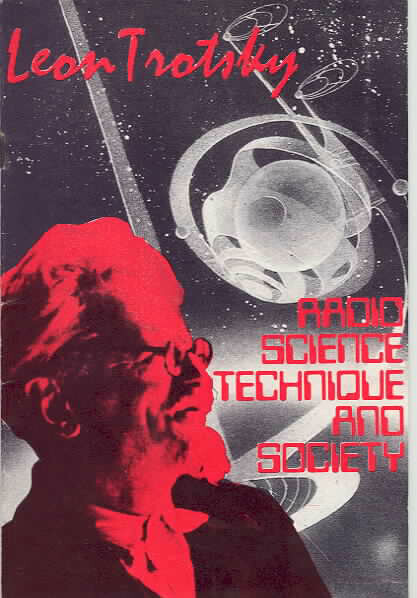 This speech by Trotsky, delivered only a couple of years before his expulsion from Russia, comes from a period when men could only dream of the controlled release of atomic energy and of space travel, and when the science of electronics, the basis of modern automatic control of factory production, was in its infancy, in the shape of radio broadcasting. But Trotsky, with the vision born of a thorough grasp of Marxist science, here explains why November 1917 and scientific advance are indissolubly linked. Moreover the sections on science and war show that the theory of the hydrogen-bomb as the ultimate weapon and the Great Deterrent are not as novel, nor as valid, as some people imagine. COMRADES, I have just come from the Turkmenistan jubilee celebrations. This sister-republic of ours in Central Asia today commemorates the anniversary of its foundation. It might seem that the subject of Turkmenistan is remote from that of radio technique and from the Society of Friends of Radio, but in fact, there is a very close connexion between them. Just because Turkmenistan is far it ought to be near to the participants in this Congress. Given the immensity of our federative country, which includes Turkmenistan – a land covering five to six hundred thousand versts, bigger than Germany, bigger than France, bigger than any European State, a land where the population is scattered among oases, where there are no roads – given these conditions, radio-communication might have been expressly invented for the benefit of Turkmenistan, to link it with us. We are a backward country; the whole of our Union, including even the most advanced parts, is extremely backward from the technical standpoint, and at the same time we have no right to remain in this backward state, because we are building socialism, and socialism presupposes and demands a high level of technique. While constructing roads through the countryside, improving them and building bridges to carry them (and how terribly we need more such bridges! ), we are obliged at the same time to catch up with the most advanced countries in the field of the latest scientific and technical achievements – among others, first and foremost, that of radio technique. The invention of the radio-telegraph and radio-telephone might have occurred especially to convince the bilous sceptics among us of the unlimited possibilities inherent in science and technique, to show that all the achievements that science has registered so far are only a brief introduction to what awaits us in the future. Let us take the last twenty-five years – just a quarter of a century – and recall what conquests in the sphere of human technique have been accomplished before our eyes, the eyes of the older generation to which I belong. I remember – and probably I am not the only one among those present to do so, though the majority here are young people – the time when motor cars were still rarities. There was no talk, even, of the aeroplane at the end of the last century. In the whole world there were, I think, 5,000 motor cars, whereas now there are about 20 million, of which 18 million are in America alone – l5 million light cars and three million trucks. The motor car has before our eyes become a means of transport of first-class importance. I can still recall the confused sounds and rustlings which I heard when I first listened to a phonograph. I was then in the first form at secondary school. Some enterprising man who was travelling around the cities of south Russia with a phonograph arrived in Odessa and demonstrated it to us. And now the gramophone, grandchild of the phonograph, is one of the most commonplace features of domestic life. And aircraft? In 1902, that is, twenty-three years ago, the British man of letters, Wells (many of you will know his science-fiction novels), published a book  in which he wrote, almost in so many words, that in his personal opinion (and he considered himself a bold and adventurous fantast in technical matters) approximately in the middle of this present twentieth century there would be not merely invented but also to some degree perfected, a flying machine heavier than air that could be used for operations of war. This book was written in 1902. We know that aircraft played a definite part in the imperialist war – and there are still twenty-five years to go to mid-century! And cinematography? That’s also no small matter. Not so very long ago it didn’t exist; many present will recall that time. Nowadays, however, it would be impossible to imagine our cultural life without the cinema. All these innovations have come into our lives in the last quarter of a century, during which men have, in addition, accomplished also a few trifles such as imperialist wars, when cities and entire countries have been laid waste and millions of people exterminated. In the course of this quarter-century more than one revolution has taken place, though on a smaller scale than ours, in a whole series of countries. In twenty-five years life has been invaded by the motor-car, the aeroplane, the gramophone, the cinema, radio-telegraphy and radio-telephony. If you remember only the fact that, according to the hypothetical calculations of scholars, not less than 250,000 years were needed for man to pass from a simple hunter’s way of life to stock-breeding, this little fragment of time, twenty-five years, appears as a mere nothing. What does this fragment of time show us? That technique has entered a new phase, that its rate of development is getting continually faster and faster. Liberal scholars – now they are no more – commonly used to depict the whole of the history of mankind as a continuous line of progress. This was wrong. The line of progress is curved, broken, zig-zagging. Culture now advances, now declines. There was the culture of ancient Asia, there was the culture of antiquity, of Greece and Rome, then European culture began to develop, and now American culture is rising in skyscrapers. What has been retained from the cultures of the past? What has been accumulated as a result of historical progress? Technical process, methods of research. Scientific and technical thought, not without interruptions and failures, marches on. Even if you meditate on those far-off days when the sun will cease to shine and all forms of life die out upon the earth, nevertheless there is still plenty of time before us. I think that in the centuries immediately ahead of us, scientific and technical thought, in the hands of socialistically-organized society, will advance without zig-zags, breaks or failures. It has matured to such an extent, it has become sufficiently independent and stands so firmly on its feet, that it will go forward in a planned and steady way, along with the growth of the productive forces with which it is linked in the closest degree. IT IS the task of science and technique to make matter subject to man, together with space and time, which are inseparable from matter. True, there are certain idealist books – not of a clerical character, but philosophical ones – wherein you can read that time and space are categories of our minds, that they result from the requirements of our thinking and that nothing actually corresponds to them in reality. But it is difficult to agree with this view. If any idealist philosopher, instead of arriving in time to catch the nine pm train, should turn up two minutes late, he would see the tail of the departing train and would be convinced by his own eyes that time and space are inseparable from material reality. The task is to diminish this space, to overcome it, to economize time, to prolong human life, to register past time, to raise life to a higher level and enrich it. This is the reason for the struggle with space and time, at the basis of which lies the struggle to subject matter to man – matter, which constitutes the foundation not only of everything that really exists, but also of all imagination. Our struggle for scientific achievements is itself only a very complete system of reflexes, i.e. of phenomena of a physiological order, which have grown up on an anatomical basis that in its turn has developed from the inorganic world, from chemistry and physics. Every science is an accumulation of knowledge, based on experience relating to matter, to its properties, of generalized understanding of how to subject this matter to the interests and needs of man. The more science learns about matter, however, the more “unexpected” properties of matter it discovers, the more zealously does the decadent philosophical thought of the bourgeoisie try to use the new properties or manifestations of matter to show that matter is not matter. The progress of natural science in the mastering of matter is paralleled by a philosophical struggle against materialism. Certain philosophers and even some scientists have tried to utilize the phenomena of radioactivity for the purpose of struggle against materialism: there used to be atoms, elements, which were the basis of matter and of materialist thinking, but now this atom has come to pieces in our hands, has broken up into electrons, and at the very beginning of the popularity of the electronic theory a struggle has even flared up in our party around the question whether the electrons testify for or against materialism. Whoever is interested in these questions will read with great profit Vladimir Ilyich’s work on Materialism and Empirio-Criticism. In fact neither the “mysterious” phenomena of radioactivity nor the no less “mysterious” phenomena of wireless transmission of electro-magnetic waves do the slightest damage to materialism. The phenomena of radioactivity, which have led to the necessity of thinking of the atom as a complex system of still utterly “unimaginable” particles, can be directed against materialism only by a desperate specimen of a vulgar materialist who recognizes as matter only that which he can feel with his bare hands. But this is sensualism, not materialism. Both the molecule, the ultimate chemical particle, and the atom, the ultimate physical particle, are inaccessible to our sight and touch. But our organs of sense, though the Instruments with which knowledge begins, are not at all, however, the last resort of knowledge. The human eye and the human ear are very primitive pieces of apparatus, inadequate to reach even the basic elements of physical and chemical phenomena. To the extent that in our thinking about reality we are guided merely by the everyday findings of our sense organs it is hard for us to imagine that the atom is a complex system, that it has a nucleus, that around this nucleus electrons move, and that from this there result the phenomena of radioactivity. Our imagination in general accustoms itself only with difficulty to new conquests of cognition. When Copernicus in the sixteenth century discovered that it was not the sun that moved round the earth but the earth round the sun, this seemed fantastic and conservative imagination still to this day finds it hard to adjust itself to this fact. We observe this in the case of illiterate people and in each fresh generation of schoolchildren. Yet we, people of some edutcation, despite the fact that it appears to us, too, that the sun moves round the earth, nevertheless do not doubt that in reality things happen the other way round, for this is confirmed by extensive observation of astronomical phenomena. The human brain is a product of the development of matter, and at the same time is an instrument for the cognition of this matter; gradually it adjusts itself to its function, tries to overcome its limitations, creates ever new scientific methods, imagines ever more complex and exact instruments, checks its work again and yet again, step by step penetrates into previously unknown depths, changes our conception of matter, without, though, ever breaking away from this basis of all that exists. Radio-activity, as we have already mentioned, in no way constitutes a threat to materialism, and it is at the same time a magnificent triumph of dialectics. Until recently scientists supposed that there were in the world about ninety elements, which were beyond analysis and could not be transformed one into another – so to speak, a carpet for the universe woven from ninety threads of different qualities and colours. Such a notion contradicted materialist dialectics, which speaks of the unity of matter and, what is even more important, of the transformability of the elements of matter. Our great chemist, Mendeleyev, to the end of his life was unwilling to reconcile himself to the idea that one element could be transformed into another; he firmly believed in the stability of these “individualities”, although the phenomena of radioactivity were already known to him. But nowadays no scientist believes in the unchangeability of the elements. Using the phenomena of radioactivity, chemists have succeeded in carrying out a direct “execution” of eight or nine elements and, along with this, the execution of the last remnants of metaphysics in materialism, for now the transformability of one chemical element into another has been proved experimentally. The phenomena of radioactivity have thus led to a supreme triumph of dialectical thought. The phenomena of radio technique are based on wireless transmission of electro-magnetic waves. Wireless does not at all mean non-material transmission. Light does not come only from lamps but also from the sun, being also transmitted without the aid of wires. We are fully accustomed to the wireless transmission of light over quite respectable distances. We are greatly surprised, though, when we begin to transmit sound over a very much shorter distance, with the aid of those very same electro-magnetic waves which underlie the phenomena of light. All these are phenomena of matter, material processes – waves and whirlwinds – in space and time. The new discoveries and their technical applications show only that matter is a great deal more heterogeneous and richer in potentialities than we had thought hitherto. But, as before, nothing is made out of nothing. The most outstanding of our scientists say that science, and physics in particular, has in recent times, arrived at a turning point. Not so very long ago, they say, we still approached matter, as it were, “phenomenally”, i.e., from the angle of observing its manifestations, but now we are beginning to penetrate ever deeper into the very interior of matter, to learn its structure, and we shall soon be able to regulate it “from within”. A good physicist would, of course, be able to talk about this better than I can. The phenomena of radio-activity are leading us to the problem of releasing intra-atomic energy. The atom contains within itself a mighty hidden energy, and the greatest task of physics consists in pumping out this energy, pulling out the cork so that this hidden energy may burst forth in a fountain. Then the possibility will be opened up of replacing coal and oil by atomic energy, which will also become the basic motive power. This is not at all a hopeless task. And what prospects it opens before us! This alone gives us the right to declare that scientific and technical thought is approaching a great turning-point, that the revolutionary epoch in the development of human society will be accompanied by a revolutionary epoch in the sphere of the cognition of matter and the mastering of it ... Unbounded technical possibilities will open out before liberated mankind. PERHAPS, though, it is time to get closer to political and practical questions. What is the relation between radio technique and the social system? Is it socialist or capitalist? I raise the question because a few days ago the famous Italian, Marconi, said in Berlin that the transmission of pictures at a distance by means of Hertzian waves is a tremendous gift to pacifism, foretelling the speedy end of the militarist epoch. Why should this be? These ends of epochs have been proclaimed so often that the pacifists have got all ends and beginnings mixed up. The fact that we shall be able to see at a great distance is supposed to put an end to wars! Certainly, the invention of a means of transmitting a living image over a great distance is a very attractive task, for it is insulting to the optic nerve that the auditory one is at present, thanks to radio, in a privileged position in this respect. But to suppose that from this there must result the end of wars is merely absurd, and shows only that in the case of great men like Marconi, just as with the majority of people who are specialists in a particular field – even, one may say, with the majority of people in general – scientific thinking lays hold of the brain, to put the matter crudely, not as a whole, but only in small sectors. Just as inside the hull of a steamship impenetrable partitions are placed so that in the event of an accident the ship will not sink all at once, so also in man’s consciousness there are numberless impenetrable partitions: in one sector, or even in a dozen sectors, you can find the most revolutionary scientific thinking, but beyond the partition lies philistinism of the highest degree. This is the great significance of Marxism, as thought which generalizes all human experience, that it helps to break down these internal partitions of consciousness through the integrity of its world outlook. But, to get closer to the matter in hand – why, precisely, if one can see one’s enemy, must this result in the liquidation of war? In earlier times whenever there was war the adversaries saw each other face to face. That was how it was in Napoleon’s day. Only the creation of long-distance weapons gradually pushed the adversaries further apart and led to a situation in which they were firing at unseen targets. And if the invisible becomes visible, this will only mean that the Hegelian triad has triumphed in this sphere as well – after the thesis and the antithesis has come the “synthesis” of mutual extermination. I remember the time when men wrote that the development of aircraft would put an end to war, because it would draw the whole population into military operations, would bring to ruin the economic and cultural life of entire countries, etc. In fact, however, the invention of a flying machine heavier than air opened a new and crueller chapter in the history of militarism. There is no doubt that now, too, we are approaching the beginning of a still more frightful and bloody chapter. Technique and science have their own logic – the logic of the cognition of nature and the mastering of it in the interests of man. But technique and science develop not in a vacuum but in human society, which consists of classes. The ruling class, the possessing class, controls technique and through it controls nature. Technique in itself cannot be called either militaristic or pacifistic. In a society in which the ruling class is militaristic, technique is in the service of militarism. We must not lag behind! VICTORY over poverty and superstition is ensured to us, provided we go forward technically. We must not lag behind other countries. The first slogan which every friend of radio must fix in his mind is: Don’t lag behind! Yet we are extraordinarily backward in relation to the advanced capitalist countries; this backwardness is the main inheritance that we have received from the past. What are we to do? If, comrades, the situation were to be such that the capitalist countries continued to develop steadily and go forward, as before the war, then we should have to ask ourselves anxiously: shall we be able to catch up? And if we do not catch up, shall we not be crushed? To this we say: we cannot forget that scientific and technical thought in bourgeois society has attained its highest degree of development in that period when, economically, bourgeois society is getting more and more into a blind alley and is beginning to decay. European economy is not going forward. In the last fifteen years Europe has become poorer, not richer. But its inventions and discoveries have been colossal. While ravaging Europe and devastating huge areas of the continent, the war at the same time gave a tremendous fillip to scientific and technical thought, which was suffocating in the clutches of decaying capitalism. If, however, we take the material accumulations of technique, i.e., not that technique which exists in men’s heads, but that which is embodied in machinery, factories, mills, railways, telegraphic and telephone services etc., then here above all it is plain that we are fearfully backward. It would be more correct to say that this backwardness would be fearful for us if we did not possess the immense advantage which consists in the Soviet organization of society, which makes possible a planned development of technique and science while Europe is suffocating in its own contradictions. Our present backwardness in all spheres must not, however, be covered up, but must be measured with a severely objective yardstick, without losing heart but also without deceiving oneself for a single moment. How is a country transformed into a single economic and cultural whole? By means of communications: railways, steamships, postal services, the telegraph and the telephone – and now radio-telegraphy and radio-telephone. How do we stand in these fields? We are fearfully backward. In America the railway network amounts to 405,000 kilometres, in Britain to nearly 40,000, in Germany to 54,000, but here to only 69,000 kilometres – and that with our vast distances! But it is much more instructive to compare the loads that are carried, in these countries and here, measuring them in ton-kilometres i.e. taking as the unit one ton transported over one kilometre’s distance. The USA last year carried 600 million ton-kilometres, we carried 48,500,000, Britain 30 million, Germany 69 million, i.e., the USA carried ten times as much as Germany, twenty times as much as Britain and two or three times as much as the whole of Europe along with ourselves. Let us take the postal service, one of the basic means of cultural communication. According to information provided by the Commissariat of Posts and Telegraphs, based on the latest figures, expenditure on postal communications in the USA last year amounted to a milliard and a quarter roubles, which means 9 roubles 40 kopecks per head of population. In our country postal expenditure comes to 75 million, which means 33 kopecks per head. There’s a difference for you – between 9 roubles 40 kopecks and 33 kopecks! The figures for telegraph and telephone services are still more striking. The total length of telegraph wires in America is three million kilometres, in Britain half a million kilometres, and here 616,000 kilometres. But the length of telegraph wires is comparatively small in America because they have a lot of telephone wires – 60 million kilometres of them, whereas in Britain there are only six million and here only 311,000 kilometres. Let us neither mock at ourselves, comrades, nor take fright, but firmly keep these figures in mind; we must measure and compare, so as to catch up and surpass, at all costs! (Applause) The number of telephones – another good index of the level of culture – is in America 14 million, in Britain one million, and here 190,000. For every hundred persons in America there are thirteen telephones, in Britain two and a bit and in our country one-tenth, or, in other words, in America the number of telephones in relation to the number of inhabitants is 130 times as great as here. As regards radio, I do not know how much we spend per day on it (I think the Society of Friends of Radio should work this out), but in America they spend a million dollars, i.e., two million roubles a day on radio, which makes about 700 millions a year. These figures harshly reveal our backwardness. But they also reveal the importance that radio, as the cheapest form of communication, can and must have in our huge peasant country. We cannot seriously talk about socialism without having in mind the transformation of the country into a single whole, linked together by means of all kinds of communications. In order to introduce it we must first and foremost be able to talk to the most remote parts of the country, such as Turkmenistan. For Turkmenistan, with which I began my remarks today, produces cotton, and upon Turkmenistan’s labours depends the work of the textile mills of the Moscow and Ivanovo-Voznesensk regions. For direct and immediate communication with all points in the country, one of the most important means is radio – that is, of course, if radio in our country is not to be a toy for the upper strata of the townspeople, who are established in more privileged conditions than others, but is to become an instrument of economic and cultural communication between town and country. LET US not forget that between town and country in the USSR there are monstrous contradictions, material and cultural, which as a whole we have inherited from capitalism. In that difficult period we went through when the town took refuge in the country and the country gave a pood of bread in exchange for an overcoat, some nails or a guitar, the town looked quite pitiful in comparison with the comfortable countryside. But in proportion as the elementary foundations of our economy have been restored, in particular our industry, the tremendous technical and cultural advantages of the town over the country have reasserted themselves. We have done a great deal in the sphere of politics and law to mitigate and even out the contrasts between town and country. But in technique we have really not made a single big step forward so far. And we cannot build socialism with the countryside in this technically deprived condition and the peasantry culturally destitute. Developed socialism means above all technical and cultural levelling as between town and country, i.e., the dissolving of both town and country into homogeneous economic and cultural conditions. That is why the mere bringing closer together of town and country is a question of life and death for us. While creating the industry and institutions of the town capitalism held the country down and could not but do this: it could always obtain the necessary foodstuffs and raw materials not only from its own countryside but also from the backward lands across the ocean or from the colonies, produced by cheap peasant labour. The war and the post-war disturbances, the blockade and the danger that it might be repeated, and finally the instability of bourgeois society, have compelled the bourgeoisie to take a closer interest in the peasantry. Recently we have heard bourgeois and social-democratic politicians more than once talk about the link with the peasantry. Briand, in his discussion with Comrade Rakovsky about the debts, laid emphasis on the needs of the small landholders, and in particular the French peasants. Otto Bauer, the Austrian “Left” Menshevik, in a recent speech spoke about the exceptional importance of the “link” with the countryside. Above all, our old acquaintance, Lloyd George – whom, true, we have begun to forget a little – when he was still in circulation organized in Britain a special land league in the interests of the link with the peasantry. I don’t know what form the link would take in British conditions, but on Lloyd George’s tongue the word certainly sounds knavish enough. At all events, I would not recommend that he be elected patron of any rural district, nor an honorary member of the Society of Friends of Radio, for he would, without fail, put over some swindle or other. (Applause) Whereas in Europe the revival of the question of the link with the countryside is, on the one hand, a Parliamentary-political manoeuvre, and, on the other, a significant symptom of the tottering of the bourgeois regime, for us the problem of economic and cultural links with the countryside is a matter of life and death in the full sense of the word. The technical basis of this linkage must be electrification, and this is directly and immediately connected with the problem of the introduction of radio on a wide scale. In order to approach the fulfilment of the simplest and most urgent tasks it is necessary that all parts of the Soviet Union be able to talk to each other, that the country be able to listen to the town, as to its technically better-equipped and more cultured elder brother. Without the fulfilment of this task the spread of radio will remain a plaything for the privileged circles of the townspeople. It was stated in your report that in our country three-quarters of the rural population do not know what radio is, while the remaining quarter know it only through special demonstrations during festivals, etc. Our programme must provide that every village not only should know what radio is but should have its own radio receiving station. THE DIAGRAM attached to your report shows the distribution of members of your Society according to social class. Workers make up 20 per cent (that’s the small figure with the hammer); peasants 13 per cent (the still smaller figure with the scythe); office workers 49 per cent (the respectable figure carrying a brief-case); and then comes 18 per cent of “others” (it’s not stated who they are exactly, but there is a drawing of a gentleman in a bowler hat, with a cane and a white handkerchief in his breast pocket, evidently a Nepman). I don’t suggest that these people with handkerchiefs should be driven out of the Society of Friends of Radio, but they ought to be surrounded and besieged more strongly, so that radio may be made cheaper for the people with hammers and scythes. (Applause) Still less am I inclined to think that the number of members with briefcases should be mechanically reduced. But it is necessary, though, that the two basic groups be increased, at all costs! (Applause) 20 per cent workers – that’s very little; 13 percent peasants – that’s shamefully little. The number of people in bowler hats is nearly equal to the number of workers (18 per cent) and exceeds the number of peasants, who make up only 13 per cent! It is a flagrant breach of the Soviet constitution. It is necessary to take steps to ensure that in the next year or two peasants become about 40 percent, workers 45 per cent, office workers ten per cent and what are called “others” – five per cent. That will be a normal proportion, fully in keeping with the spirit of the Soviet constitution. The conquest of the village by radio is a task for the next few years, very closely connected with the task of eliminating illiteracy and electrifying the country, and to some extent a pre-condition for the fulfilment of these tasks. Each province should set out to conquer the countryside with a definite programme of radio development. Place the map for a new war on the table! From each provincial centre first of all every one of the larger villages should be conquered for radio. It is necessary that our illiterate and semi-literate village, even before it manages to master reading and writing as it ought, should be able to have access to culture through the radio, which is the most democratic medium of broadcasting information and knowledge. It is necessary that by means of the radio the peasant shall be able to feel himself a citizen of our Union, a citizen of the whole world. 2. This address was given in the Polytechnical Museum, and was broadcast.